Q: What should my child be reading? The teachers I have spoken to say they hear this question and give this answer all the time. And they do so for a good reason. Non-fiction literature gives children a glimpse at how the world works and allows them to explore unfamiliar places, animals, cultures, and concepts. For example, a child interested in marine life can learn about the creatures residing within the very depths of the ocean and a child curious about the foods enjoyed in Japan can have their questions answered and even learn to make some of these foods themselves by following recipes found in cookbooks. Nonfiction builds on a child’s interests and curiosity, increases vocabulary and deepens background knowledge. And the topics to be explored are endless! Non-fiction differs from fiction because it requires reading for content and information. Having early experiences with informational text gives children the opportunity to practice gleaning facts, statistics, instructions and other pertinent information from text, diagrams, charts, and photographs. This is a skill used in daily life. Whether following a recipe, deciphering a bus schedule, or reading a formal contract, the ability to sift out necessary details is required to be successful. Non-fiction can also help children handle new life experiences and changes. Moving abroad, or even down the street, preparing to welcome a new sibling, or having trouble with friends- there are multitudes of printed materials at the ready to give children (and adults!) factual information about any life situation. Non-fiction comes in many forms from newspapers, magazines, educational journals, atlases, cookbooks, and encyclopedias, all of which can be found in your local library. Next time your child asks a question about wombats or Thomas Edison that you don’t have an answer for, stop by the library and check out a few books! You and your child will find what you’re looking for and a whole lot more! April is National Poetry Month in the US. Do you have a poem you remember and can recite? “Hey diddle, diddle, the cat and the fiddle…” or “Twinkle, twinkle, little star…” Poems can bring us right back to the time when we first learned them and they are a way to hand down family traditions to our own children. Poetry can take many forms. There are jump rope rhymes, European Mother Goose nursery rhymes, and African Talking Drum rhymes. There are Japanese haikus with short lines. There are silly limericks, serious verses and catchy songs. Read some poems together, or even write your own, and discover what types of poetry you and your child like best. Poetry books have their own section in the library. Apart from the children’s picture books, books of poems are located in the children’s 811 shelves. Ask your librarian to show you the way there. Rhythm and sound are important in poems. Many use rhyming words, but not all poems do. 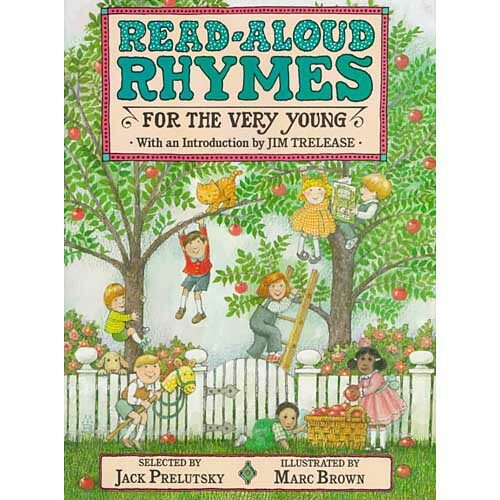 Here’s a poem that does both: “Mix a Pancake” from the book “Read-Aloud Rhymes for the Very Young” collected by Jack Prelutsky. “Mix a pancake, stir a pancake, pop it in the pan; Fry the pancake, toss the pancake–catch it if you can,” by Christina Rossetti.